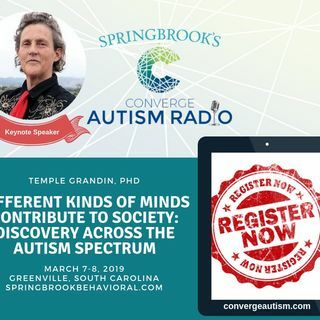 Different Kinds of Minds Contribute to Society: Discovery Across the Autism Spectrum is the keynote speech to be delivered by Dr. Temple Grandin for Springbrook Behavioral's Converge Autism Summit held March 8-9th, 2019 in Greenville, South Carolina. Tickets are still available at https://www.eventbrite.com/e/converge-autism-summit-2019-tickets-36079297149?aff=main or by going to www.convergeautism.com. This interview is a short discussion with Dr. Grandin about animal behavior (one of ... See More her favorite topics) and basic skills for working in the regular economy when you have Autism.